Ovens, ranges, Combi-ovens from Falcon, Electrolux. MKN and Lincat. 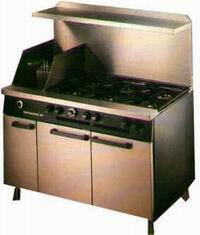 Wide range of sizes of electric or gas ovens with 4 or 6 burner or solid tops. Combi ovens from 6 GN 1/1 to 20 GN 1/1 gas or electric. Also steaming ovens, pasta cookers, wok cookers, char grills, griddles and bratt pans.